The area is surrounded by pleasant vineyards and orchards, idyllic forests and meadows, beautiful hills and tranquil fishponds. When the weather is nice, you can see Lake Balaton in the distance or admire the wild beauty of Kis-Balaton Nature Reserve from the vineyards surrounding the spa town or from the lookout tower. Discover the almost too-good-to-be-true countryside on foot (there are plenty of tempting paths to follow) or on bike, taste the local wines (go for vibrant, rich whites), get introduced to the red canna flowers, the symbols of Zalakaros, and soak in the healing waters that Zalakaros is famous for. The mere existence of the spa in Zalakaros proves that if you dig deep enough, you’ll find thermal water in Hungary. Just imagine the surprise of the engineers drilling for hydrocarbon in the 1960s and finding 96 °C water erupting from 2000 metres underground. Today, the water arrives from two wells, and has a ‘cool’ temperature of 53 °C. The therapeutic effect of the medicinal and thermal water has been proven to cure chronic gynaecological problems, diseases of the gums, acute inflammatory joint conditions. It also has beneficial effects in the post-surgical treatments of orthopaedic, neurosurgical, surgical, cardiological, circulatory and locomotor system disorders, and in the post-surgical rehabilitation of injuries and orthopaedic operations. 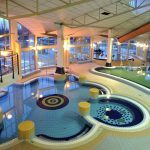 The Therapeutic Centre of the Gránit Thermal Baths features indoor and outdoor medicinal pools, a bubblicious Jacuzzi to soothe your aches away. 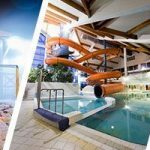 But fun elements are also heavily represented here, with adventure pool facilities comprised of 10 different water attractions, many of which are indoors and thus open in winter; but beware, the imposing Black Hole and Kamikaze slides are probably not for the fainthearted! 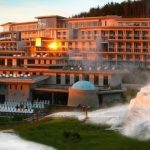 If that isn’t enough, this place has a thermal beach, with several pools hot enough to be open year-round, all situated in more than 10 hectares of beautiful parkland.